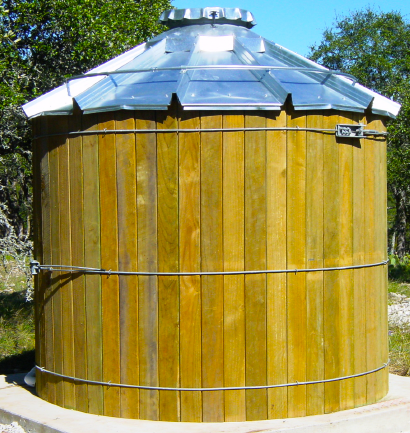 TimberTanks are water storage tanks that combine the ageless beauty of wood with the durability of galvanized steel roofs and the modern technology of flexible membrane liners for water containment. Wood staves are custom milled to form a barrel shape and are banded together with galvanized steel bands to retain the circular shape. The galvanized steel roof incorporates factory formed and punched high rib roof panels which create a durable and weatherproof roof structure. Our TinyTimber Tanks are a smaller version of the standard TimberTank and are often more suitable for individual residential projects. 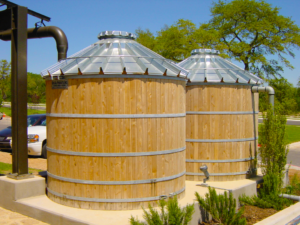 These tanks start out at a 4ft diameter holding 375 gallons of water and include options for a 6ft and 8ft diameter in varying heights and capacities. These tanks are built in our warehouse and shipped direct to the project site. 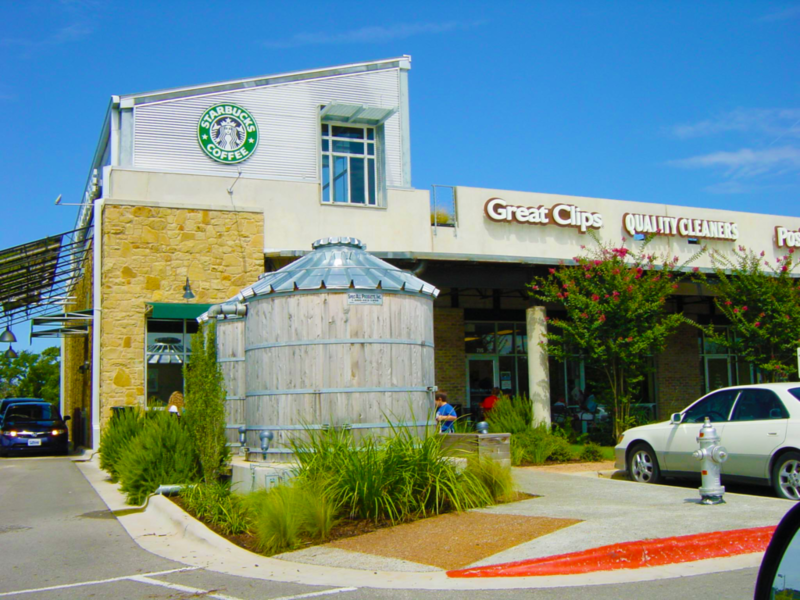 TinyTimber Tanks do not require a concrete foundation and each comes standard with a 25-degree standing seam roof with mosquito-resistant screen, an overflow flange, hose spigot, and NSF-61 certified liner. TimberTanks do not use redwood and cypress wood, which were harvested from old growth trees. The old style unlined wood water tanks required clear (no knots) heartwood which is generally unavailable unless someone is illegally harvesting old growth trees. 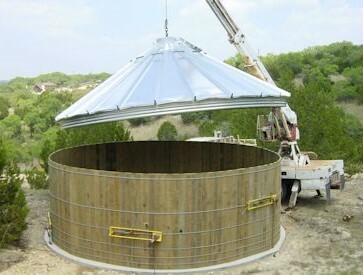 Some companies may offer wood water storage tanks that would potentially have a short life span due to the use of wood grades that are not suitable for water bearing structures. Our eastern red cedar wood staves are sawn from timber salvaged from land clearing operations rather than from standard timber harvesting. These eastern red cedar logs would otherwise be burned or chipped. Radiata pine wood staves are another option and are sawn from sustainable plantation harvested logs. 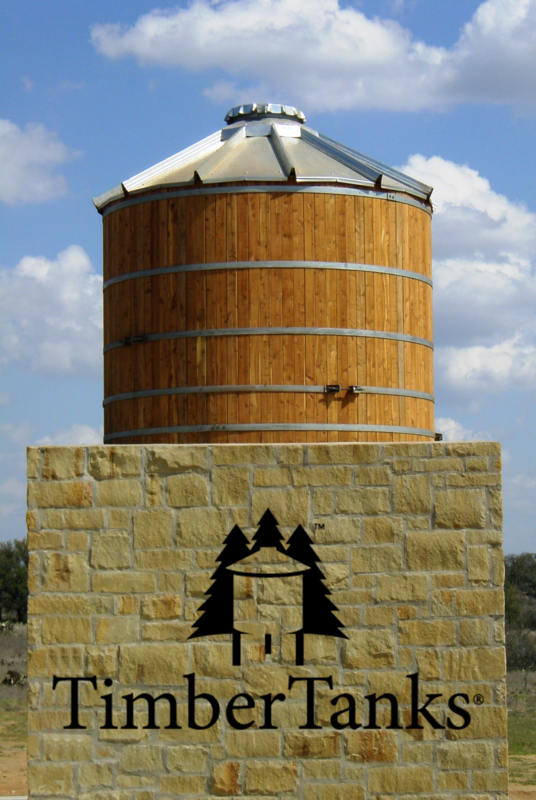 TimberTanks are only constructed with wood staves produced from sustainable or reclaimed lumber and with roofs containing a large percentage of recycled steel. Eastern red cedar (juniperus virginiana) wood staves are used for TimberTanks that require no wood treatment chemicals nor preservatives. This wood exhibits a great degree of resistance to rot and decay. This resistance is due to the high levels of naturally occurring chemicals that are created by the wood as it changes from sap wood to heart wood. 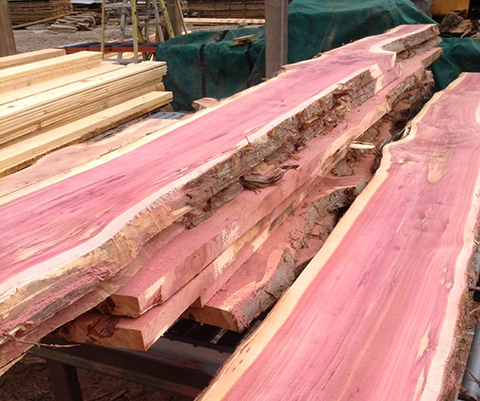 When Eastern red cedar is first milled, it will be red to orange to purple in color. After an Eastern red cedar TimberTank is assembled, the wood can be sealed to retain the red color. If it is not sealed, the TimberTank wood will fade to gray within 3 to 6 months. The wood staves can also be pressure washed to restore the original wood color. Eastern red cedar wood TimberTanks are often used for historic and antique applications because the wood color will fade to a light gray appearance after a few months. If the antique appearance is desired, the wood should not be sealed, painted nor stained. 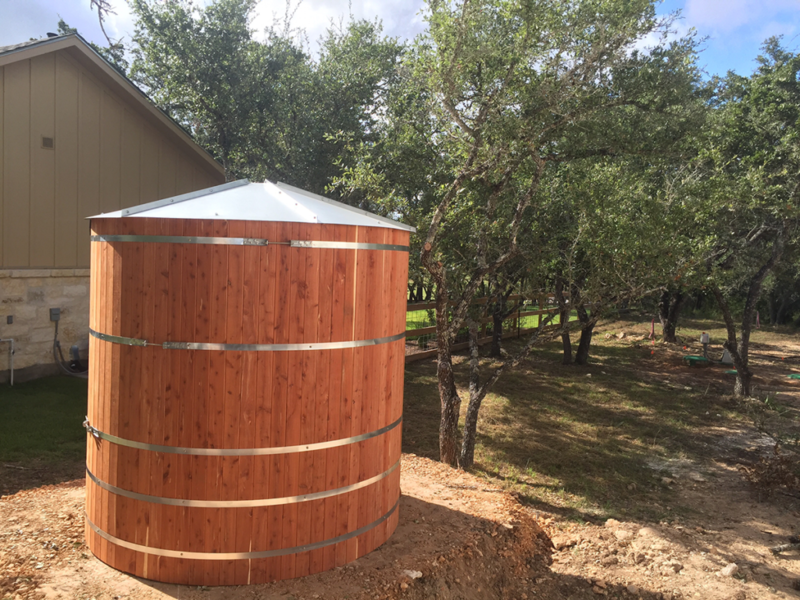 The faded Eastern red cedar will develop the appearance of the old cypress wood tanks. Radiata pine wood is harvested from sustainable forest tree farms in New Zealand. Radiata pine is fast-growing and exhibits the strength of Southern yellow pine but is less susceptible to warpage and bowing. The Radiata pine wood used for TimberTank wood staves is always treated and kiln dried. Wood treatments used are typically CCA 0.6 #/CF or ACQ but other treatment chemicals are sometimes used. Other species are available but are only used if specified for a specific project. This wood can only be used for water tanks after the wood is chemically treated and kiln dried. 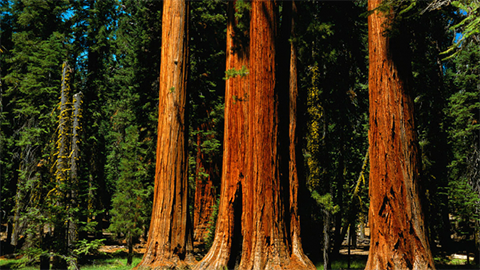 Redwood has been used in the Western US for 200 years for wood tanks. Unfortunately, the redwood used for tank wood must be clear, all-heart wood and this grade is not available except from old-growth trees. Old-growth trees are a non-sustainable resource and their harvesting is generally illegal. TimberTanks America does not procure nor use any newly harvested redwood in its products. On rare occasions, old redwood tanks are dismantled and the wood is re-processed for the construction of a new TimberTank. Some people may use non-tank-grades of redwood to construct wood tanks but these tanks will have a short life because these non-tank-grades are subject to rot and decay like other non-extractive woods. 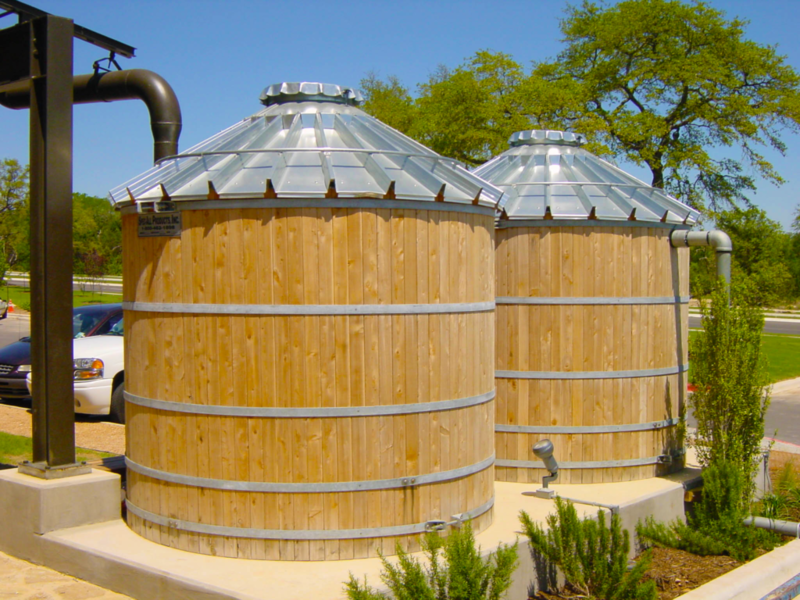 Cypress wood has also been used in the Eastern US for over 200 years for wood tanks. TimberTanks generally will not use cypress for the same reasons that we do not use redwood. The wood staves (wall boards) used in TimberTanks are machined to TimberTanks proprietary tongue and grove cross-section pattern to insure a proper fit of all staves. The edges of staves used for smaller diameter and TinyTimber tanks are also machined to a proper bevel for the tank wall curve. The wood staves are wrapped with multiple horizontal steel bindings. Bindings are galvanized steel flat bands or round steel rods. Each different binding material utilizes a method to draw the binding around the circumference of wood staves to create the required tension to support the wood staves and the liquid contained within the tank. Steel used for fabrication of the tank roof components is galvanized during the steel rolling process to the G-115 coating standard of the American Galvanizers Association. Steel roofs consist of multiple like panels formed and punched steel sheets which are bolted together on the tank to provide a weather-tight shell roof structure. 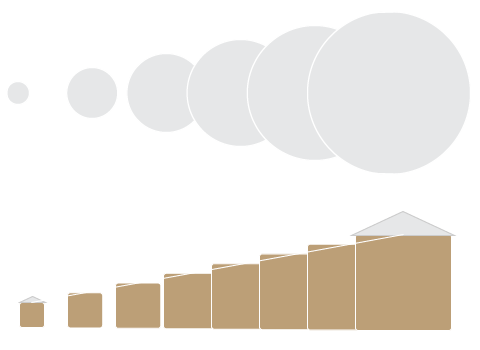 Standard roof systems are designed for Seismic Zone 2B, 90MPH 3 Second Wind Gust , and Exposure C. Roof systems may also be designed for tanks located in any wind, snow, or seismic zone. A system of preliners and flexible membrane liners are used inside of TimberTanks for water containment. Preliners are non-woven geotextiles placed around the interior of the tank wall structure and placed on the concrete foundation. 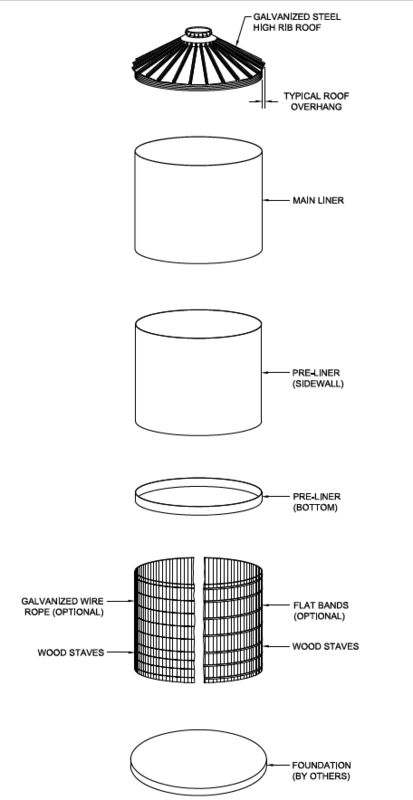 Preliners protect the main water containment liner from damage and allow moisture to wick away from the space between the tank walls and the main liner. The main liner is a factory welded and inspected flexible membrane fabricated into an open top cylindrical shape. These liners are constructed from polyethylene, polypropylene, polyvinyl chloride standard or from composite reinforced films. The main liner is suspended around the inside of the top of the tank wall structure utilizing stainless or galvanized mounting hardware and reinforced edging. Small TimberTanks and TinyTimbers can be assembled at our factory warehouse in Austin, TX, and shipped to the project site by truck. However, due to highway load width regulations, most TimberTanks must be assembled at the project site. The same holds true for tanks on a tower. Smaller towers can be prefabricated and trucked to the project site for final assembly and erection, while taller or wider towers must be built on-site. Be sure to visit our Tanks on Towers section of the website for more details. TimberTanks are available in a wide variety of sizes and capacities to fit virtually any application. *4ft diameter tanks come with a flat seam style roof only. **Custom sizes available. Use the Request a Quote form. ***Flange size and placement will affect total capacity. Ready to get started with your TimberTank project? We are too.